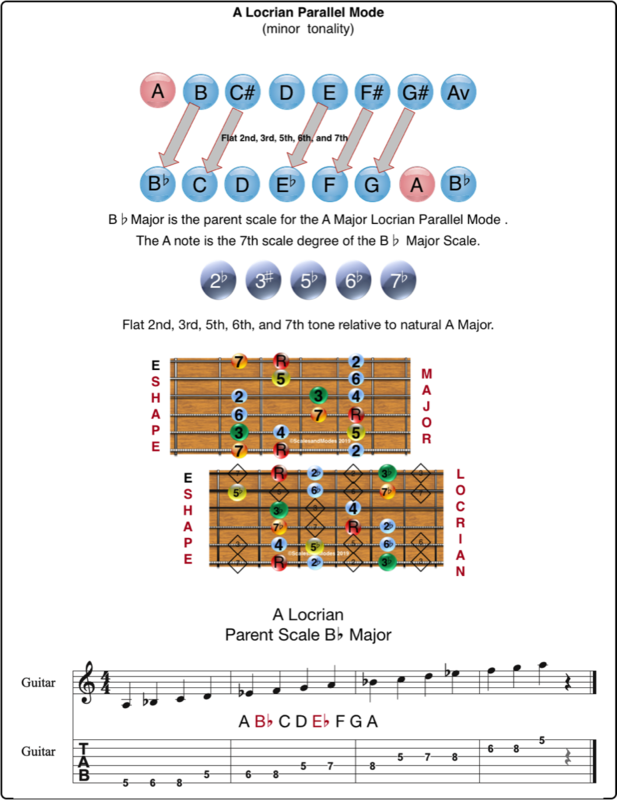 All Diagrams show the E shape of the CAGED system and use A Major as the example Major scale. This diagram shows the changes to the scale degrees when moving from the Major scale Ionian form to the Dorian mode. 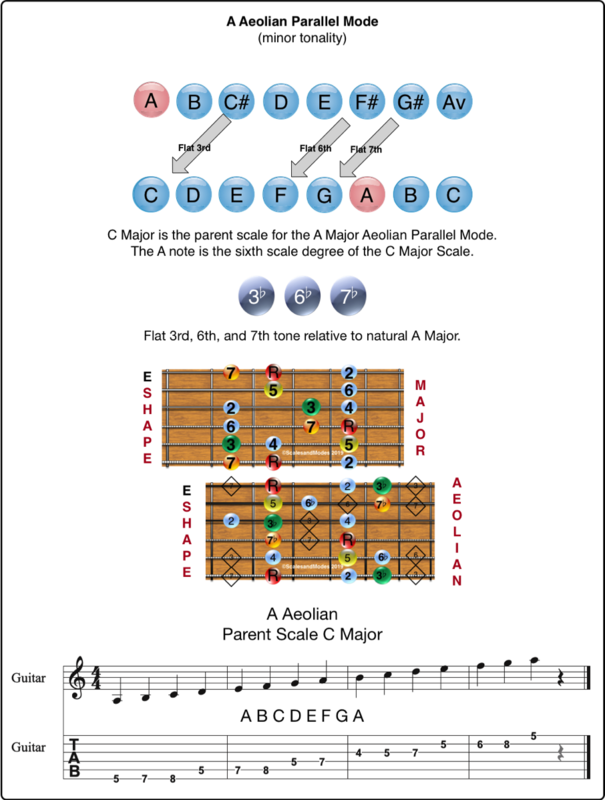 The 3rd and 7th notes are lowered 1/2 step relative to the Ionian or natural Major scale. 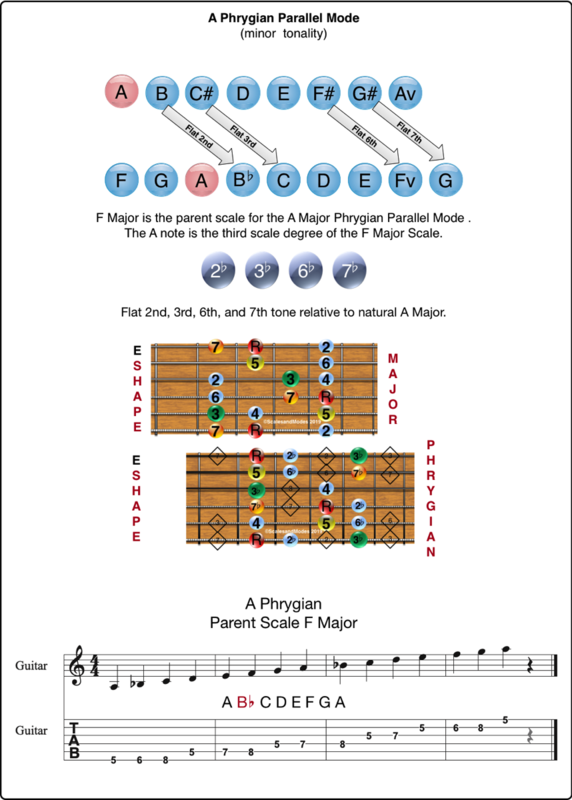 This diagram shows the changes to the scale degrees when moving from the Major scale Ionian form to the Phrygian mode. 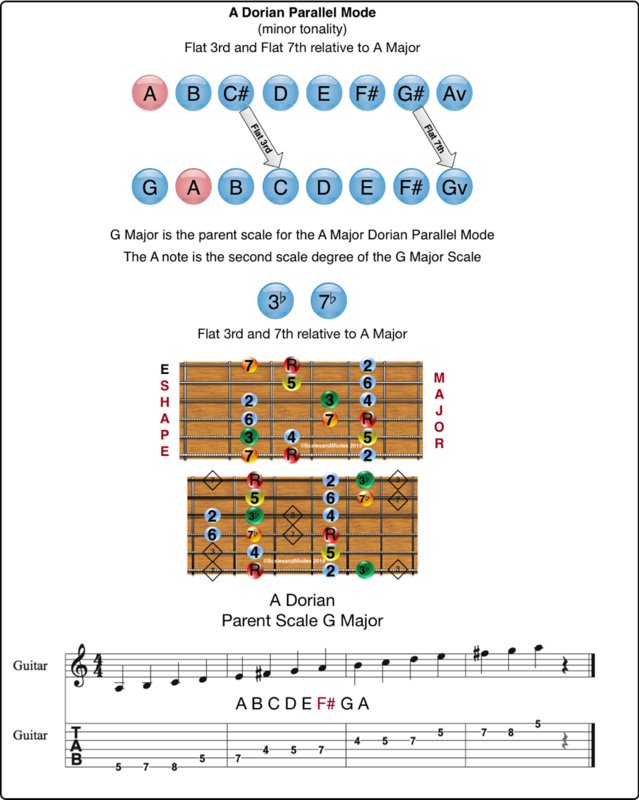 The 2nd, 3rd, 6th and 7th notes are lowered 1/2 step relative to the Ionian or natural Major scale. This diagram shows the changes to the scale degrees when moving from the Major scale Ionian form to the Lydian mode. The 4th note is raised ½ step (#) relative to the Ionian or natural Major scale. 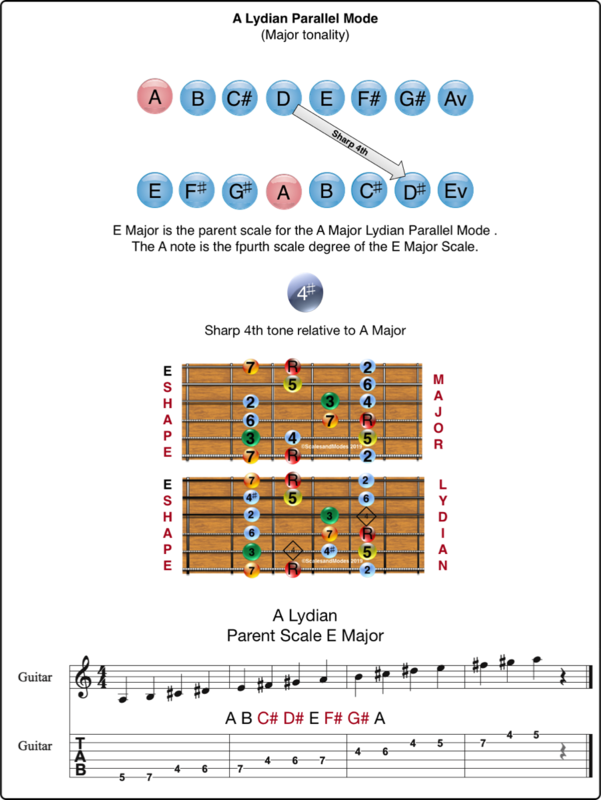 This diagram shows the changes to the scale degrees when moving from the Major scale Ionian form to the Mixolydian mode. 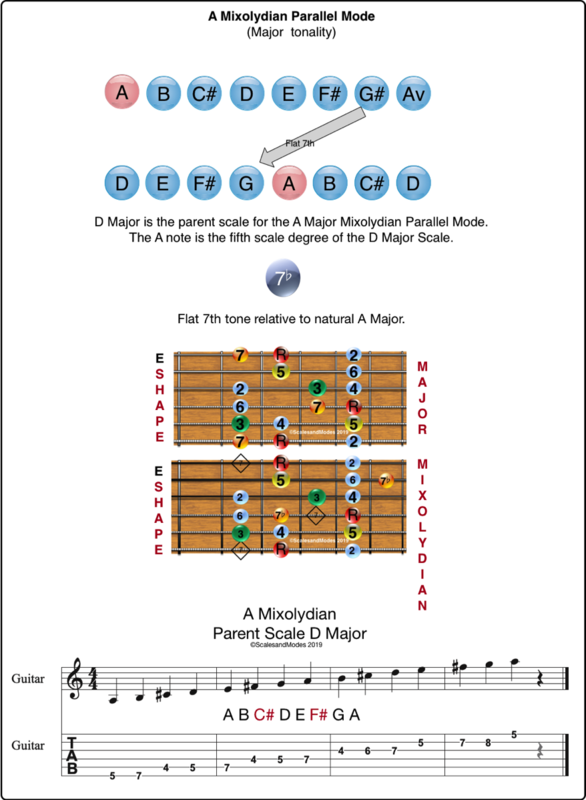 The 7th note is lowered ½ step (flat) relative to the Ionian or natural Major scale. This diagram shows the changes to the scale degrees when moving from the Major scale Ionian form to the Aeolian mode. The 3rd, 6th and 7th notes are lowered ½ step (flat) relative to the Ionian or natural Major scale. This diagram shows the changes to the scale degrees when moving from the Major scale Ionian form to the Locrian mode. The 2nd, 3rd,5th, 6th and 7th notes are lowered ½ step (flat) relative to the Ionian or natural Major scale.